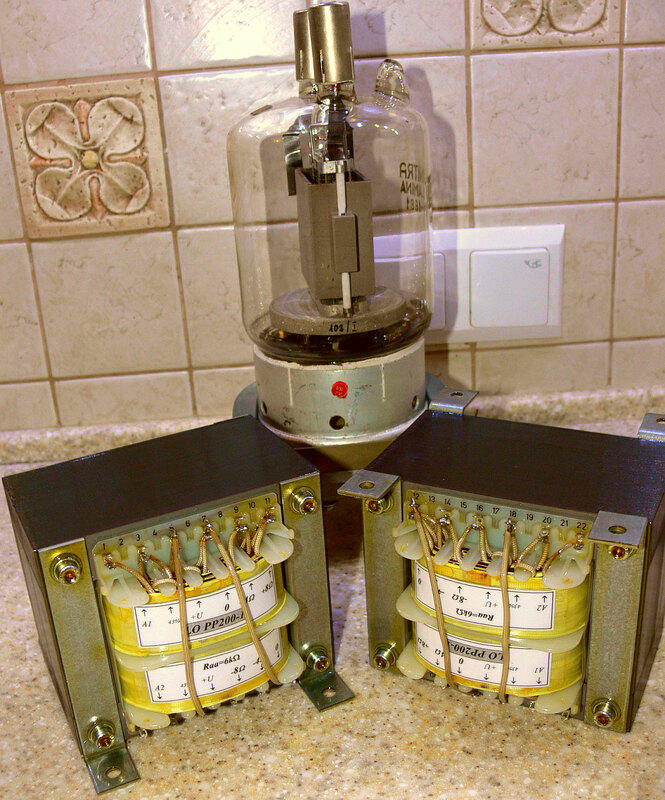 « Submachine gun Suppressor T-Line Speaker System ? … But do not even bother to look for these on those web pages. In theory – they do NOT exist. But in praxis – they DO. That is the nice difference between “Theory” and “Praxis”. A significant day today. They finally arrived. The mission, supposedly impossible, has not only proven to be possible, but in terms of the amount of wire – has actually turned out to fit in quite nicely upon the bobbin, with all the necessary interwoven windings. Quite tight a fit, actually. From the looks of it – I like what I see. It took some time and hassle, some negotiations and some convincing, but the purchase order has been Accepted. Now – it is Executed. Delivered. Done. Still fresh with the smell of the varnish. A tough purchase order, as it turned out. Based on an EI 120 profile, with enlarged bobbin and core, this pair is a first of it’s kind. PP200 stands for 200 Watts of output power handling capability (give or take). From the looks of it, something like 113 Watts should be possible. As for PP in AB1, something closer to 675 Watts would be the limit. By that time, the transformers would long gone evaporate, though. SET (green): (1800V – 500V) * (0,75A -0,05A) / 8 = 1300Vpp * 0,7App / 8=113W. PP: (green): (2300V-500V) * (0,75A -0,05A) / 2 = 1800Vp * 0,7Ap /2 = 630W. A bit thinly spread, the 200 Watts, in terms of the GU80 tubes that I shall be using, each of the pair capable to waste something like 500 Watts on the anodes, with anode temperatures exceeding 1000 degrees Centigrade, and with “no sweat”, at that. I would have preferred something like a full 600 Watts of output power handling capability, but if you can’t get what you would like, you start to negotiate. 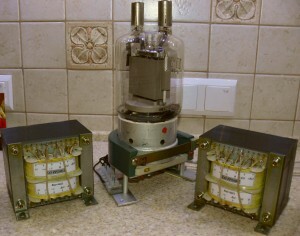 And mind you, the size of these prototype beta test units is just for starters. The future is “probably” open to go for the more appropriately sized, EI-150 based core profiles and bobbins, but I shall not say that out loud. There are some other technical issues that come into play, so let’s do it starting off small. You “could” actually try go get more output watts from such tubes, from a higher impedance transformer winding ratio, but then the peak to peak voltages would be really crazy, risk of internal or external arc over higher, not to mention the technical difficulties associated with creating a transformer of such a high impedance, stray capacitances, the bandwidth, and all. And besides, for home use, 200 Watts is way way more than I actually need, anyway. b). decent amount of kilovolts that can be handled at the peaks of the signal voltage swing. 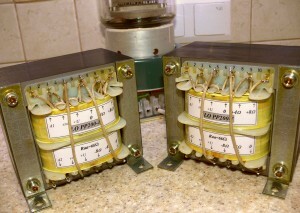 Mind you, the idle DC voltages shall be in the order of 1600 Volts. 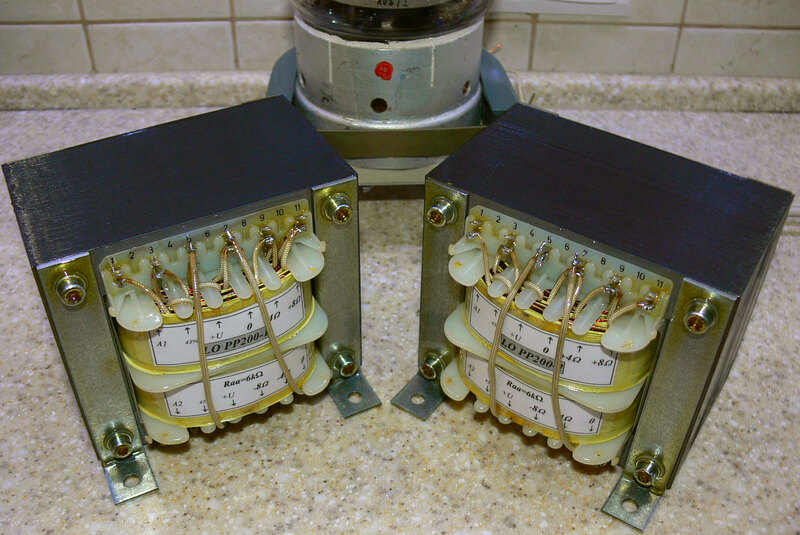 The peak-to-peak voltage excursions of the signal may even reach 2000 Volts. This implies that the DC+ 0.5 x AC peaks can be as high as 1600V + 1000V = 2600V above ground. The product has been crafted with the uttermost care, with multiple layers of insulation foil between each of the winding layers, but also between the bobbin and the core, as well as in some other places. What is guaranteed is that I am supposedly a nut case. Each unit weighs something like 6,5 kg. Somewhat bizarre, you say. Indeed. It was my personal requirement. Executed according to my personal preference and detailed specification. Invention? Probably not the first, and not the last to use this “twist”. The idea is that the Secondary is symmetrical. It is Center-Tapped to Ground. 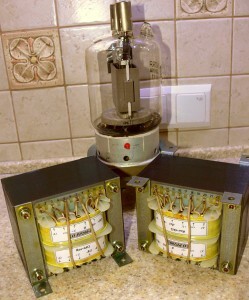 The 8 ohm speakers do NOT connect between a traditional “8 ohms” terminal and “Ground”. Actually, they do not connect to the Ground AT ALL. 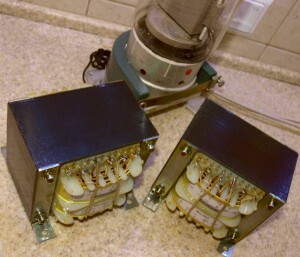 The speakers shall connect to the “+8 ohms” and the “-8 ohms” tapping. 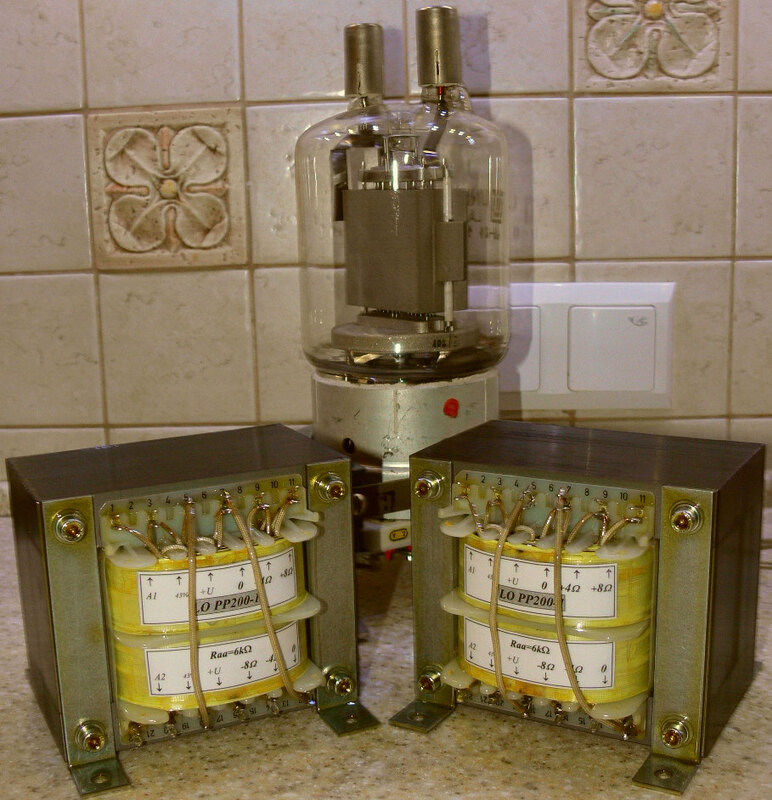 The speakers shall be driven in such a manner that the Ground is exactly in the center of symmetry, or the midpoint, between both of the speaker wires. A symmetrical transmission line of sorts. 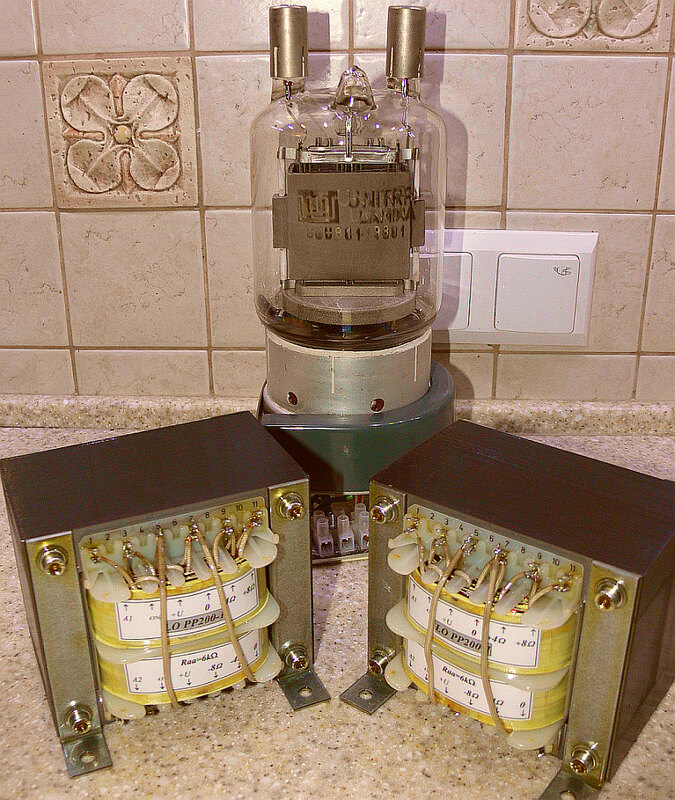 The same applies for 4 ohm speakers. 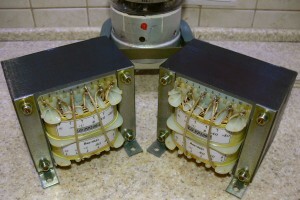 They connect to the respective “+ 4ohms” and “-4 ohms” tappings. They too see the very same Central Ground Terminal. What is the reason for such a topology? I intend to use the secondary windings so that they perform two distinct functions. a). to drive the speaker (obviously). b). to provide a current path to ground for the cathode current of the respective radio transmitter output tube (non-obviously). Yes. 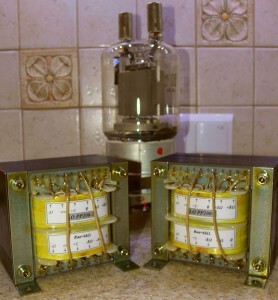 I intend to route the current, originating from the 1800V DC power supply (minus sag), via the half-primary winding of the respective output tube, via it’s respective anode, down to the cathode, and then through the SECONDARY, or rather, the appropriately “phased” half of it, to Ground. The high voltage power supply shall be in indirect contact directly with the speaker terminal. In this manner, I get the result that the Speaker’s OUTPUT VOLTAGE, as additionally modulated by the back EMF stemming from the speaker cabinet, is actually transposed back upon the cathode of the output tube in the form of a negative current feedback loop. 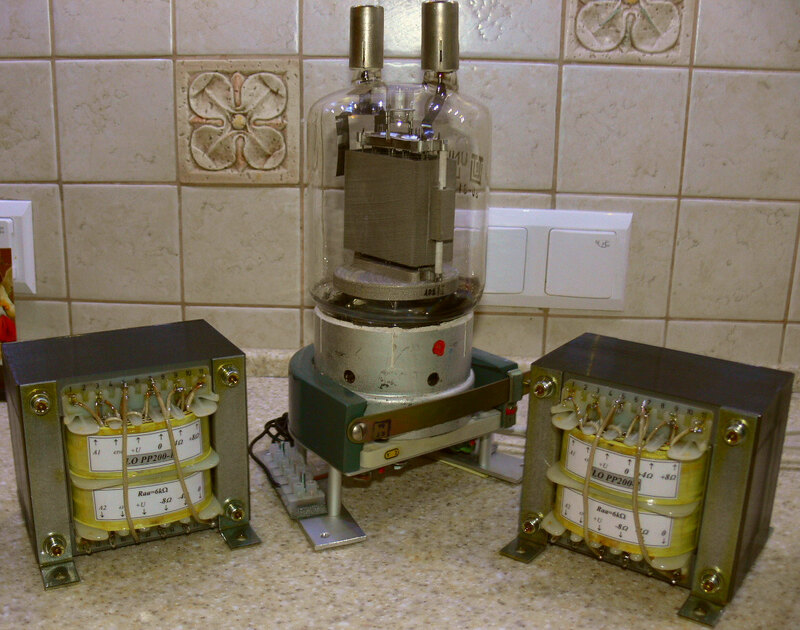 Indeed, the cathode current of the respective output tube is modulated by the EMF derived from the current flowing through the secondary and the speaker itself. This is done via two, fully symmetrical, negative current feedback paths. 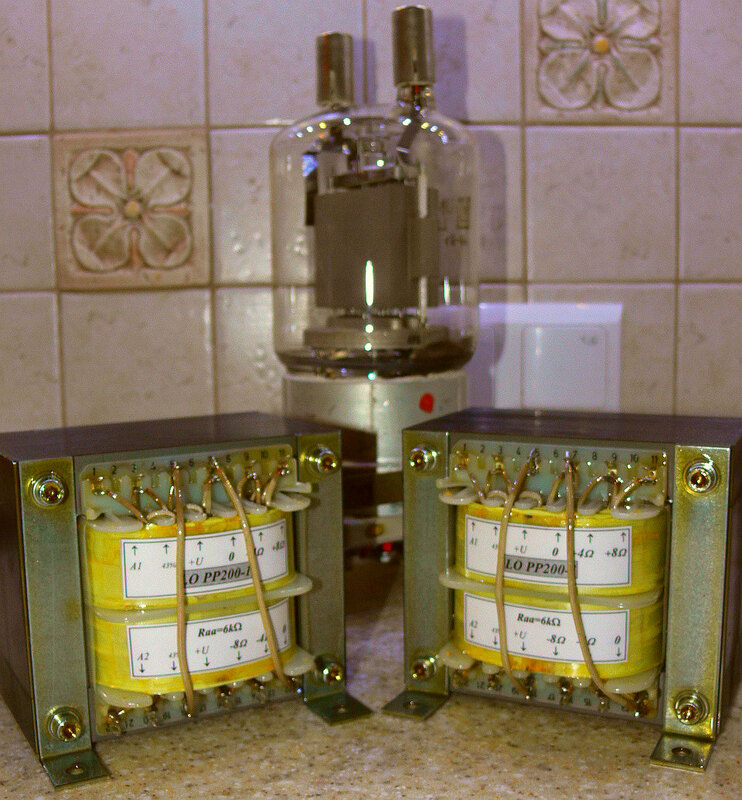 One for each respective output tube. 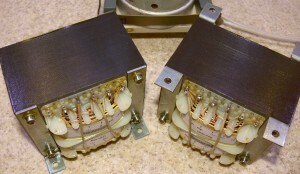 Such a topology and arrangement shall be made possible only thanks to the fully symmetrical center tapping of the ground connector of the secondary winding. As for the Primary versus Secondary interweaving / interleaving, suffice to say that it is there. Not as much interleaving as would be nice to have, but enough to provide some decent frequency response. In case of doubt – see the included photos. Given some free time, I guess that I will start assembling a dual tube set up, just to see how (if at all) such a PP output stage shall behave, or misbehave. Then we shall see where do I go from there. Unmarked territory. The Ogonowski OPT prices are reasonable, to say the least. Hand made with loving care by a guy who is in this craft for a multitude of years. 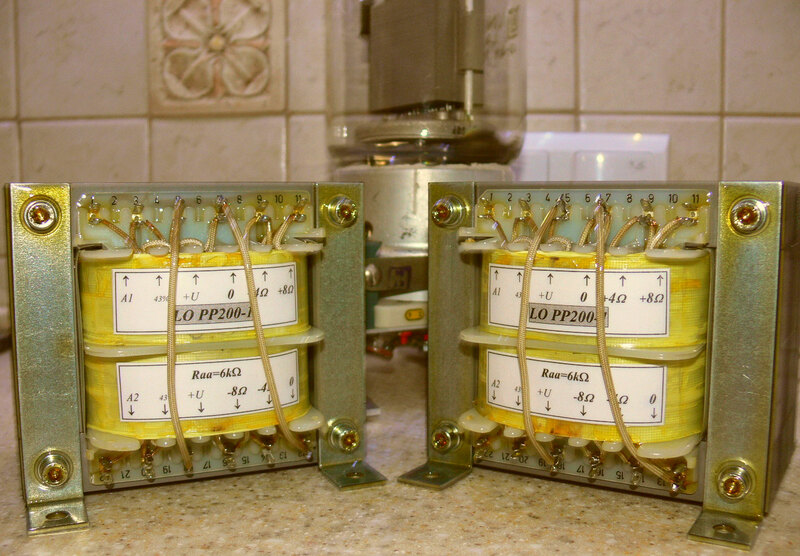 Yes, it is “supposedly” 200 Watts in push pull …. but that all depends on how far do I want to “push” them and risk “pulling” the odds in terms of the voltages and risk of blowing the interwinding insulations. Actually, it could be *MORE* power. The only true limit here is the maximum RMS current permissible to flow via the primary winding, at a given diameter of the wire. The “Current Limit” is a thermal thing and is somewhat “fixed”. You simply do not want to melt the winding. As for the Voltages – here it comes down to the typical case of “No Risk –>> No FUN !!”. But I will not be pursuing neither the “Risk”, nor the “Fun” part. I will play it safe and reasonable. And mind you, as the temperature rises, the insulation capability of the interwinding separators shall go down. As for the magnetic core, it is somewhat lavishly oversized in terms of kilograms, so I would not worry about prematurely saturating it too much.